The rise of the internet and big data unleashed public access to a torrent of information. Blockchain is the next wave of this technological revolution. For business leaders it is important to understand what blockchain is and how it affects modern-day business. Urgent Future: Blockchain does just that, by interpreting the potential impact on society, the enterprise-readiness of this fascinating technology, and the relation of blockchain with surrounding phenomena such as ICO’s and cryptocurrencies. 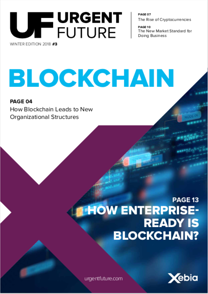 Download the FREE 2018 Urgent Future: Blockchain report now.